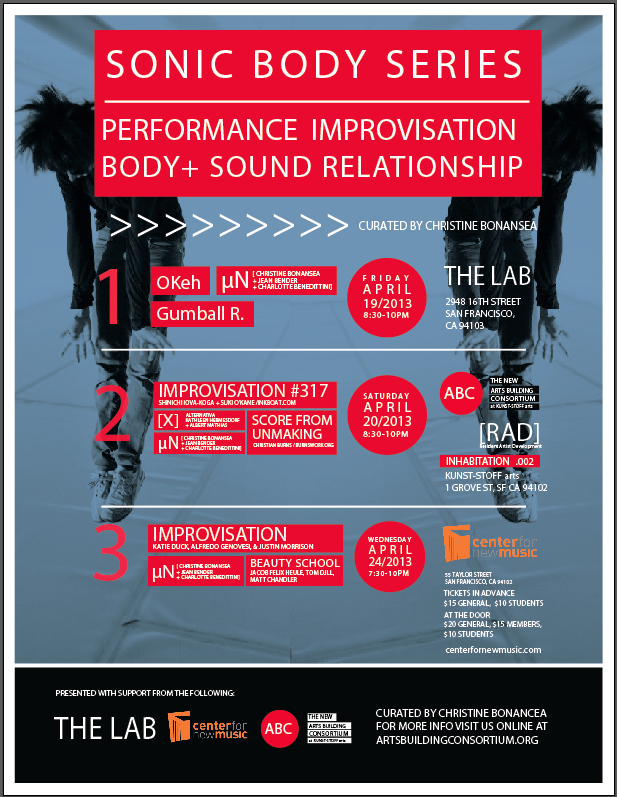 Three local and international groups of electro-acoustic and noise musicians meet dancer-performers for an evening of improvisation, creating spatial interactions and sonic abstractions in between the different bodies (body of sound and human body). Featuring: Matt Chandler (bass guitar), Tom Djll (trumpet and electronics), Jacob Felix Heule (percussion and electronics); Christine Bonansea and Jean Bender (dance and electronic noise); Alfred Genovesi (electric guitar), Katie Duck and Justin Morrison (dancers). Jean Bender and Christine Bonansea have been initiating since 2011 a research process about the interaction of the body of sound and the human body in movement. They experiment the variations of possible tensions in between the 2 masses. The spatial interaction of the bodies create new texture and forces of resistance; their friction reveals sonic abstraction, in new physical space where the error is melt to reality. Katie Duck, a master teacher, dancer, performer, improviser who has worked with many great musicians, including Derek Bailey, Han Bennink, Bill Evans, Tristan Honsinger, Cecil Taylor, Cor Fuhler, Michael Vatcher, Michael Moore, Yannis Kyriakides, ICP Orchestra, Andy Moor (from The Ex), punk bands, and experimental and electronic musicians, to name a few. Alfredo Genovesi is a free improvisational electronic guitarist who constructs a multi-layered and complex sound world. Justin Morrison, dancer performer and teacher based is San Francisco who’s been improvising with Katie Duck since 2004.